Light, tangy and a great alternative to the more usual mayo dressed chicken salads. Preheat the oven to 200oC/fan 180oC/Gas Mark 6. Line a roasting tin with foil and add the chicken breasts in a single layer then fold the edges of the foil up around the chicken to make a dish. Mix together the honey, mustard and peppercorns with 1 tablespoon of vinegar, 1 tablespoon of oil and a little salt then spread over the chicken, turning to coat both sides thinly. Roast for about 25 minutes until golden brown and the juices run clear when chicken is pierced with a knife in the centre. Crush half the raspberries with a fork then mix with the remaining vinegar and a little salt and pepper then whisk in the remaining oil. Sieve to discard the raspberry seeds. 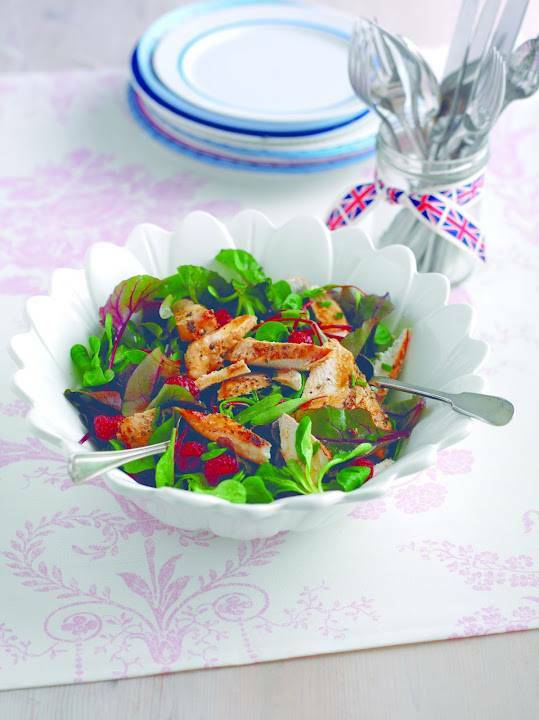 Add the salad leaves to a serving bowl, toss with the dressing then sprinkle with the remaining raspberries. Cut the hot chicken into thin slices, toss through the salad, drizzle with the juices from the foil then sprinkle with the chopped herbs if using and serve immediately. "Welcome To The Weekend Hop :18/05/2012…"
Yum!! it looks delicious, I love chicken salads! This looks really delicious Clairejustine. I am a fan of chicken so I know I would enjoy it! :) The presentation was also great! Do enjoy the rest of your day. Hi Clairejustine: I'm Connie at http://hotflashncraftn.blogspot.com/, a new GFC friend. I would love it if you stop by and be mine, too. That looks fantastic. I'm copying the recipe. Thanks so much for sharing!